Atop a hill overlooking a seaside port sits a boarding house named Coquelicot Manor. Since the building is run by her family, Umi Matsuzaki carries out many of the duties involved in managing the small establishment, such as preparing meals for her fellow boarders. When she isn't at home, she is a student at the local high school—one that is currently dealing with a small crisis. In anticipation of the upcoming Olympic Games, a beloved old clubhouse is set to be demolished to make way for a modern building. As a result, a large part of the student body has banded together, working tirelessly to prevent this from happening. Umi finds herself helping the newspaper club to spread information about this cause where she befriends Shun Kazama, whom she gradually begins to fall in love with. But Shun is an orphan who doesn't know much about his origins, and when the two begin searching for clues to the boy's past, they discover that they may have a lot more in common than either of them could have thought. 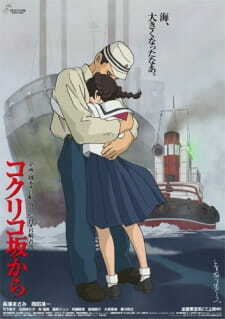 In 2012 the film won the Animation of the Year award in the 35th Japan Academy Prize and in the 11th Tokyo Anime Award. In 2013 it won the Best Foreign Animation/Family Trailer during the 14th Golden Trailer Awards and tied with The Wind Rises (Kaze Tachinu) film for the Best Animated Feature in the 12th Utah Film Critics Association. Well that's two lacklustre Ghibli movies under Goro's belt. On one hand I can understand Hayao supporting his son in his career, yet on the other hand this blatant form of nepotism is doing nothing but showing that the Miyazaki magic will disappear when he does. Earthsea was a disappointment on every level. There are some detractors of that opinion, but the general consensus from viewers is that Earthsea is far low on the list of Ghibli films you should watch. From Up On Poppy Hill at least has some modicum of charm and old school aesthetic about it that keeps it from being a complete failure however. The last thirty minutes are the best with more pace, urgency and melodramatic moments, but it’s a slog to get there. The animation is not special in any way other than bringing to life 1960's Japan with typical Ghibli detail. The story is a simple coming-of-age tale that lacks any life or bite. There is a revelation that sparks things up somewhat, but even that is ultimately diffused. Hayao himself co-wrote the script with the screenwriter of Earthsea, and I like to imagine he tried to make the clubhouse scenes lively in order to bring life to the story. The music, like everything else with this film, is inoffensive and bland. Joe Hisaishi is not in sight. There's just nothing here to latch onto and keep in your memory as something to return to. I can recall numerous scenes and musical motifs of previous Ghibli films, but from this all I will recall is the main character pulling up a flag. There are no creative scene compositions, no efficient editing tricks; no passion in the bringing of this tale. The last thirty minutes had developments that could have made a better film by themselves, in a manner similar to Grave of the Fireflies. When Hayao made Ponyo, you could see his childlike passion for the project in the bluray extras, and you can see it in the work itself, it's bold and full of life, and contains the most amazing depiction of sea waves I've seen in animation. Goro needs to ask himself why he's a director, and for our sake he needs to find the answer on his own time, and not on Ghibli's dime. From up on Poppy Hill, another great addition to the Ghibli Studio collection in my opinion. Let me start off by saying that what attracts me to to any work associated with Hayao Miyazaki is the element of magic, creative settings and unforgettable characters. Even Tales of EarthSea, directed by Goro Miyazaki (same director for this movie) had some of these elements...however, you wont necessarily find that when you watch From up on Poppy Hill. The story is about family, love and determination. I found that each of these elements were strongly portrayed throughout movie by the two main characters and in the end these elements brought the characters together. The symbolic themes such as the flags, the photographs and the club house are shown many times and tie major elements together.Though these elements make the story strong, it also makes it very melodramatic and it doesn't help that the pacing is very slow. Throughout the movie, I never felt in "awe" and there were some scenes where I felt I lost attention. There were also scenes and major themes that weren't fully developed and left me with a "there's something missing" feeling. Though the story is very melodramatic to say the least and when explaining all of the drama, I felt that they rushed the explanations and therefore made everything seem a tad unbelievable. All in all though, the story is very sweet and even with the slow pacing, it will leave you with a warm fuzzy feeling on the inside. Everything from the scenery to the character design were impeccable. the colours were strong and like any Ghibli Production the details put into making the watchers believe that they are in the story were definitely there. Every song and the BGM fit well with the scene and the and in movies with lots of drama where the music helps to understand the characters feelings, the music is very important. For example, the main/ending song "Summer of Goodbye" is a slow and gentle song which is kind of how the movie was. I also felt that the music did a lot to relate the time period such as the song, "I Shall Walk Looking Up" which was kind of a barber shop quartet type of song which made the story actually feel like it was taking place in the 60's. I'm going to focus on the main characters Umi and Shun even though the other characters were important, I think these two made the movie as interesting as it was. You can tell right off the bat that Umi is a very responsible person, she takes care of everyone in her house, all the while going to school. She also seems to be a very symbolic person as she [SPOILER ALERT] follows a the routine of bringing a glass of water and flowers to her fathers picture and raising the flag for him every morning [END SPOILER]. Shun is a rebel with a cause because from the beginning of when we meet him, he shows his daredevil (attention seeking) side by jumping from the club house. Though he wants to draw attention to his cause (preserving the club house), we know that what he really wants is the attention of one special girl. The love between these characters is strong and innocent and it makes you think how far are you willing to compromise for the one you love. Beautiful art and music and characters, just wish the story had fewer developmental flaws. It's a definite must see because it's a lovely story...however if you are expecting magic and intrigue, don't get your hopes up. Miyazaki Goro's sophomore attempt at directing proves that he can stand apart from his legendary father, but perhaps he is still walking in the shadow of the behemoth Studio Ghibli. Yet his recent work does not back down in its fight to earn a place in their legacy. From Up on Poppy Hill gives us the standard we expect from a Ghibli film: beautiful art, consistent and vibrant animation complementing stories and characters with either a whole lot of heart or charm and sometimes both. But while Miyazaki makes all the right steps, he has a long way to go to give us something that is clearly his, something that makes us say "That's a Goro film". While every Ghibli movie feels like a distinctly magical journey, this one never quite gets there. Yet where it's headed is nowhere bad at all. Set in the post-war, pre-Olympics 1960s Japan, From Up on Poppy Hill successfully re-creates a time and place where the protagonists Umi and Shun meet and fall in love. Their hesitant romance does not come without life's complications. They meet for the first time twice; once, as Shun and Umi unknowingly communicate to one another through Umi's maritime flags, and again at school where daringly, Shun makes a bold and stupid move to save the school's clubhouse. There seems to be a shared destiny, as Shun travels on his father's tugboat every morning, seeing raised flags trying to find a lost soul, and as Umi reaches down into a pool to accept his hand as he emerges. However, they both come to learn that their paths have crossed even before their meeting. While their romance is sweet, shy at times and quiet, there is a secret between their families that forces them both to acknowledge and accept that they should not continue with one another. They cannot help but fall in love anyway. Miyazaki portrays life's disruptions and joys with gentility. Even though the twists and turns are the subject of ridiculous soap operas, Miyazaki's respectful handling of the feelings and characters involved creates a different experience. What could be seen as trite, ends up as palpable, never overwrought drama. Although the way things neaten up happily by the end seems to be too easy a resolution. The secret involves an actually compelling issue that could have been explored further, but the safest neatest way is the route chosen. Umi and Shun manage as likeable and sweet characters, though they don't exceed our expectations of them. The other supporting characters give life to the film and they all occupy a space that feels very much like it's theirs. Without them, there'd be no personality in the boarding house, school and town. Despite being worthwhile extras, they aren't memorable side characters (like the old woman from My Neighbour Totoro or the artist in the woods from Kiki's Delivery Service). The film resolves to let them be adequate, not exceptional. As aforementioned, From Up on Poppy Hill has been Ghibli-stamped and approved for its visual quality. Despite having a montage sequence with still shots (which seems to be very much contrary to Studio Ghibli's reputation for painstaking detail and excellence), the entire film looks spectacular.While it does not boast the stunning scope of the Ghibli epics or the fantastical vision of the others or even the technical genius, it has the quiet, solid sensibilities of movies like Whisper of the Heart and Only Yesterday. In fact, this film might take you right back to Whisper of the Heart, Kondou Yoshifumi's great masterpiece. (Although Umi and Shun's romance does not hit the highs of Shizuku and Seiji's; perhaps due to Shizuku being such a strong, charismatic and compelling protagonist, while Umi is less powerful and effective as a lead). We remember from Only Yesterday the stagnant beautiful countryside, we remember from Whisper of the Heart the urban sprawl of a modern city, and in From Up on Poppy Hill, we find a Yokohama and its beautiful seaside in the midst of industrial growth and change. The one place where From Up on Poppy Hill disappoints is its music. Ghibli films tend to boast timelessly powerful scores and soundtracks. The music here tries to invoke a sense of place and time. While this works marvelously in some cases (for instance, the use of Sakamoto Kyu's eternally lovely classic "Ue o Muite Arukou"), it misses in many others. Some tracks just seem to undo the overall atmosphere and the results are noticeable. Miyazaki's vision is much more focussed for this film as compared to Tales from Earthsea, a project that from even its conception was problematic. From Up on Poppy Hill is more relaxed in tone, and perhaps this was Miyazaki's own stance to his film-making. What I said earlier about the characters can perhaps be said about the film itself: it is adequate, though not exceptional. From Up on Poppy Hill is a definite must-watch for those disappointed with Miyazaki Goro. The film shows how much he has grown as a filmmaker. This is a satisfying little movie. Maybe his next attempt will give us something a bit more fulfilling. Certainly this taste has left us hungering for more from this director. You're certainly not going to watch this film condemning it for not being like his father's art and you won't watch it and think it's like his father's work either. It doesn't feel like a Hayao film or a Takahata film. It's not trying to be. Goro and Yonebayashi (director of Arrietty) have their work cut out for them to leave their signatures on their movies, but given time, perhaps their vision will become clearer. In the meantime, Miyazaki Goro shall walk looking up. I can't speak for everyone, but I actually really enjoyed From Up on Poppy Hill. The characters were likeable - not particularly in-depth or rich, but likeable - and the quirky supporting cast were always there to pick up any slack. In fact, I would say that the supporting cast is one of my favourites from a Ghibli film so far, beautifully designed and entertaining to watch. The story was engaging, too: a simple teenage romance with a couple of surprising plot twists and an ultimately uplifting result. It may not have been full of drama and suspense, but the film had that wonderful Ghibli charm to it, reminding me of some of their other simpler works: Only Yesterday and Whisper of the Heart (the latter being a personal all-time favourite). Whilst the plot may have been slow-moving, a faster one wasn't really required. The world of the story was, as always, built beautifully, and it was a pleasure to watch events unfold even when they were unfolding quite cautiously. This, of course, was because of the astounding artwork, backgrounds and animation more than anything. There's not really anything more to say on this, it's just beautiful. The music also deserves a mention. The opening and closing songs were lovely, very fitting and atmospheric, and whilst I can't really pinpoint a specific part of the background OST that I enjoyed, I can safely say that it always suited the scene it was played against, whether or not it was anything particularly special. I was also pleasantly surprised at how good the English dubbed voice acting was, for the most part. (I can't comment on the original Japanese as I didn't watch it). So, to summarise; this film isn't for everyone. It doesn't have a very describable plot, nor does it have any particular deep characterisation or meaning (unless I was missing something). It's comparable to a nice soup in winter; it might not be the most exciting or substantial thing ever, but it's comforting and sympathetic and it makes you feel all warm and fuzzy inside. Unless, of course, you don't like soup. But anyway, you get my point. It's not the best work ever to come from Ghibli, but it's still a lovely film, it has an irresistible charm and it's definitely worth a watch. Why has nobody fansubbed this yet? Here are the anime movies that we've picked out as the top ten of 2011, all from different genres and all ones you should've seen already.